It is a proven fact that group prayers have more power and they are readily accepted. Keeping this fact in mind, it gives me immense pleasure to inform you about a new service started on this blog for the benefit of us all, 'We Sai Children'. With the inspiration of Shirdi Sai Baba, a 'Prayer Club for Blog Readers' has been started apart from various other services like 'Sending Prayers to Shirdi', 'Free Udi Delivery Seva' and 'Sharing Experiences of Devotees with Shirdi Sai Baba'. This step of mine was not a planned one. Today morning just a thought came up in my mind about Prayer Club. Even I did not have to think how it will be accomplished or what steps will I have to take like everything was ready and only my action on it was pending. There is something else also behind this. While talking with another Sai Devotee, she expressed her desire to put a prayer for her friend on this blog. I told her to send me the prayer as usual and it will be taken to Shirdi. But since it is not always sure when the prayers will reach Shirdi, she requested me to post on this blog. I assured her to try on my side, but completely forgot it afterwards. This happened yesterday and today morning this thought gathered in my mind. I took it as wish of Baba and started working on it. Let me now tell you how I (rather Shirdi Sai Baba) have planned regarding this 'Prayer Club'. - The main theme of this 'Prayer Club' is 'Everyone pray for One and One pray for Everyone'. - At the end of this post I have placed a chat box. - Devotee who wish to submit their prayers can mail me on this mail id. - The same will be uploaded here as and when received and other devotees can pray of him/her. - Devotees who wish to pray for others can write down few words in the chat box. - While submitting prayers please include the words 'Prayer for club' in the subject link to make it easy to trace. - If you do not wish your name to appear in the prayer, please write it specifically otherwise it will be presumed to include it. - The date of receipt of prayers will be noted onwards. It will remain posted for next one month and will be removed after that so as to make room for new ones. - Prayers can be sent on this mail id. Hope you all participate in this small step of mine. Please do not forget to bookmark this page for further reference. This has been the first time ever that such a 'Prayer Club' is started on any blog. The more the readers, the more blessings of Sai Baba. Baba Please Bless me and my Family specially my mother who is not keeping well due to weak health.She is doing vrat for you so Bless her and always keep her happy & tension free. Baba I will also be doing paanch guruvaar ka vrat for my Marriage soon with the person whom ILovevery much so Please give me your Blessings and fulfill my wish.I have full faith on you. Oum Sai Ram, my humble pranam on your lotus feet. Baba, please, fulfill my wishes. I got lots of problems where I am working. Also, I was planning to go out of this country to some western country for a long time. I hope Baba will hear my prayer. Also, please, grant me permission to visit Shirdi soon. Bless me and everyone in this universe. With your blessings and shraddha and saburi. Baba, please help me get that job. It is very important for me, so please me in this. I am praying wholeheartedly. Please Baba, don't disappoint me. We pray to you, please accept our sincere prayers ever for all souls in this world, who either pray for their own sufferings or pray for their near and dear to recover soon from all kinds of obstacles and diseases be it small and big. You always give hope with your great words that GOD CAN EVEN CHANGE ONE'S HARD DESTINY to our pure devotion. Please give relief to all such suffering souls and rescue them without much hardships. OM SAI RAM SRI SAI RAM JAI JAI SAI RAM. GOD IS GREAT. 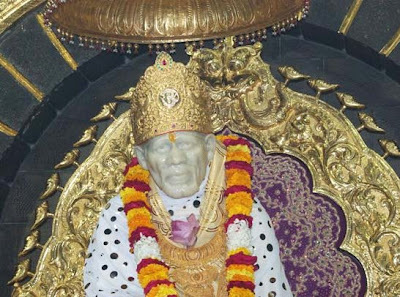 Baba I know this is kulyug but please give to those who need, bless evryone, give everyone positive thoughts stop all evil and bad, give everyone peace and listen to evryone, it may take time people but baba is with everyone...sab ka malik ek! Baba i am so sorry for my mistakes I dint follow you for so many days but you have always been for me and you put in the right path.Please stay with me forever and I can easily face any difficulties in my way.I know you have decided everything for me,I dont have to ask you anything in specific.Keep showering your blessings and love on me and give the a chance so that I can help others and serve you as much as possible.Give me the oppurtunity to feel you and stay with you. BABA please bless everybody, help everyone, be with each and everyone at all times. Baba Please bless all who are needy and are in pain..
Baba you are great..Please forgive your childrens and show them the holy path..
Baba you are the only one who can save us n give us a happy life,,..
Baba please show us the positive result..
We have full faith in your grace..
We will have Shraddha n Saburi. Baba u r great n u are the only hope for us. I have full faith in your grace n your blessings.. So I will not worry n fret now.. I have kept all my fears n worries in your lotus feets n pray to you for the well being of my family.. I have many times felt your grace on us..
Like yesterday your udi helped my hubby in his well being. I am really grateful to u n hope u will keep on showering your blessing on us..
Baba pls help me too..
Baba Pls show us ray of hope..
Baba we surrender in your holy feets.. Thanks Baba for your blessing..
We surrender ourself to your holy feets..
We r in your lotus feet..
you will only save us from disease..
where r u...please help us baba..
we we are feeling very lonely..
Why we are suffering mentally n physically ..
Baba pls help us.,shower ur blessing on us..
We have faith in u baba..
you will surely help us.. Thank you Sai Baba,You havefinalyy grant our wishes..
WE are happy for your grace and blessings on us..
We bow down in your lotus feet and surrender ourself . We have full faith and perseverance. we got a reward for our patience. My son and husband are not fit these days. My son remains ill these days. Please people pray that my son and husband get well as soon as possible. I also want that I be blessed with a flat in Shirdi, so that I can spend as much time I can in this shirdi, the holy place. Baba I know you will always take care of me.I always pray to you to show me the right path,I can take the failure as blessing but be with me and drive me towards the success path.Give me proper guidance to overcome my problems fear and sorrow.Give me strength to fight for myself and remove all the hurdles on my way.I hope you have planned something for me,give me patience to wait until your blessing comes to me. sai baba sabki help kariye . Main apne aap ko bahut bhagyashaali maan rahi hoon jo aapki sharan me aane ka soubhagya prapt hua hai mujhe. Baba main aapse mere poore pariwaar ki aur ankur ke pariwaar ki khushiya aur sabke liye aashirwaad ki kaamna karti hoon. Baba main ankur se shaadi karna chahti hoon aur aapko sab pata hai ki main apne parents ko bhi dukh nahi dena chati.Baba mere parents is shaadi ke liye jald se jald yaiyaar ho jaaye.Mere papa ,mummy ,bhai ,behen aur ankur ke papa aur mummy ki tabiyat theek rahe aur aapka aashirwaad hamesha ham sab par bana rahe. jai Sai Ram ji ki. Baba, please help me by giving stability in mind. Even though, I am doing parayan, my mind is not silent and always remain worried. Please help me baba, where are you or I had done so much sin in past life that's why u are not looking at me? But Baba, I beg you to please help me in fighting my inner enemies like laziness, unstable mind, untruthfulness and negative attitude for life. Help me to overcome this. If parayan is the only solution than bless me to do it again and again. Your blessing is the only thing to complete parayan successfully. SAI BABA PLEASE HELP IN THIS DIFFICULT SITUATION AND PERIOD GOING THROUGH. YOU HAD HELP EVERYONE BABA. NOTHING IS HIDDEN WITH YOU YOU KNOW BABA EVERYTHING. I AM STRUGGLING WITH MY CAREER. STILL 1 TO 2 YEARS I AM JOBLESS & REMAINING 1 TO 2 YEARS TO MANY JOBS WERE CHANGED WITHOUT SATISFICATION. PLEASE LORD GIVE ME THE WAY. difficulties & happiness are 2dynamics. certainly a brigt career & ahappy life will follow. Bless me baba...i have been waiting patiently for so long now...I am your child.So please forgive my mistakes and show bless me! OM SHRI SAI NATH KO PRANAM....Bless us on this GURUPOORNIMA with your grace.bless us so that we can move ahead in life the way you want us to move.Forgive our sins and let good things happen.
. prbhu ji sada he kirpa hum py bnay rhkna sai ji sdha hi kirpa hum pr bnay rkhna. Jo rashta shae ho us pr chlay rhkna sai ji kirpa bnay rhkna . ap ko koty koty praanm.